Cong will be swept away in Karnataka, says BJP chief. 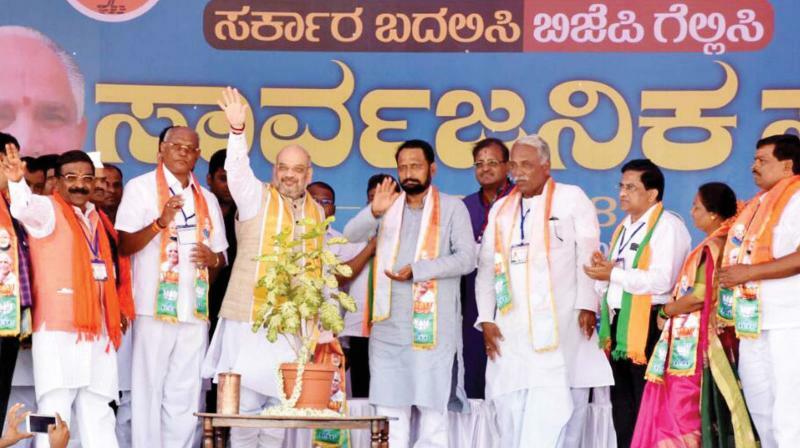 Hubballi: Painting a doomsday scenario for the ruling Congress in Karnataka, BJP national president, Amit Shah claimed here on Saturday that it would be wiped out by a BJP “tsunami” and Chief Minister Siddaramaiah would lose both from Badami and Chamundeshwari these coming elections. Mr Shah, who was addressing a public meeting in Ilkal town of Bagalkot district , also claimed that state BJP chief, B S Yeddyurappa had to step down as Chief Minister in 2008 due to a conspiracy hatched by the Congress and appealed to the people to give him an opportunity to take Karnataka to number one position in terms of development in the country. He contended that while the state government had failed to take any steps to help farmers although over 3,000 of them had committed suicide in the state, the Union government had come to their rescue by providing a minimum support price for their crop. “The Congress is also responsible for the killing of 28 BJP and RSS workers in the state,” he charged, urging the people to strengthen the hands of Prime Minister Narendra Modi by bringing the BJP to power in Karntaka. Accusing the state government of being corrupt and misusing crores of rupees released by the Centre as funds for various schems, he told the people that they had only a few days more to make the country Congress-free. Later, addressing BJP leaders at a meeting of the Shakti Kendra, Mr Shah said party candidates could win 80,000 votes in the Assembly elections if each worker brought at least 15 voters to the polling booth to cast a vote in favour of the BJP. Meanwhile, supporters of BJP candidate for Jamkhandi, Srikant Kulkarni staged a protest against party leader, Murugesh Nirani’s brother, Sangamesh Nirani for contesting as a rebel , and harming his chances in the constituency.